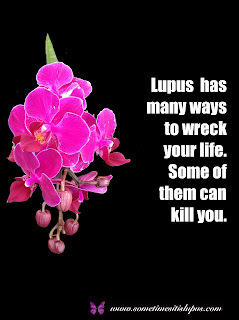 Lupus is a horrible disease, which makes life thoroughly miserable at times. So when I found out that a lovely lupie I've had a fair bit of online contact with chose to end her life recently, I fully understood that choice. 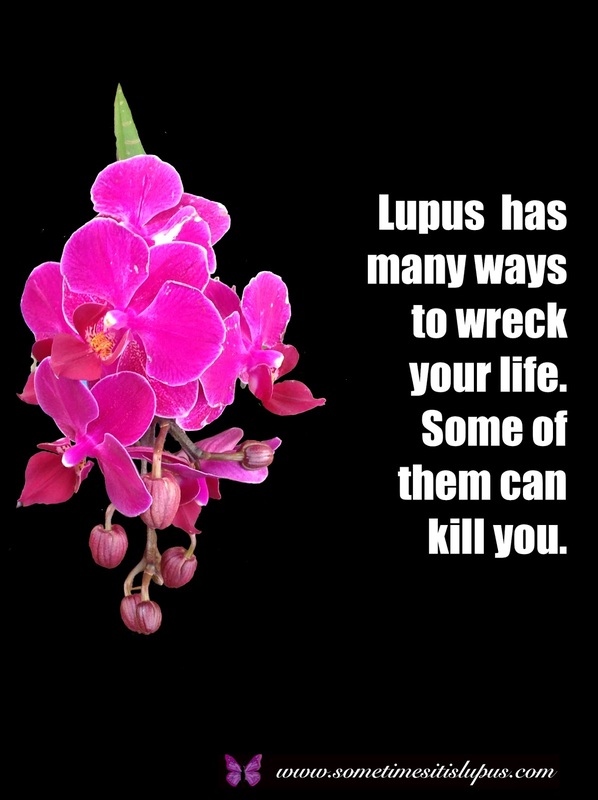 Lupus caused her death, even though that's not what will be listed on the death certificate. 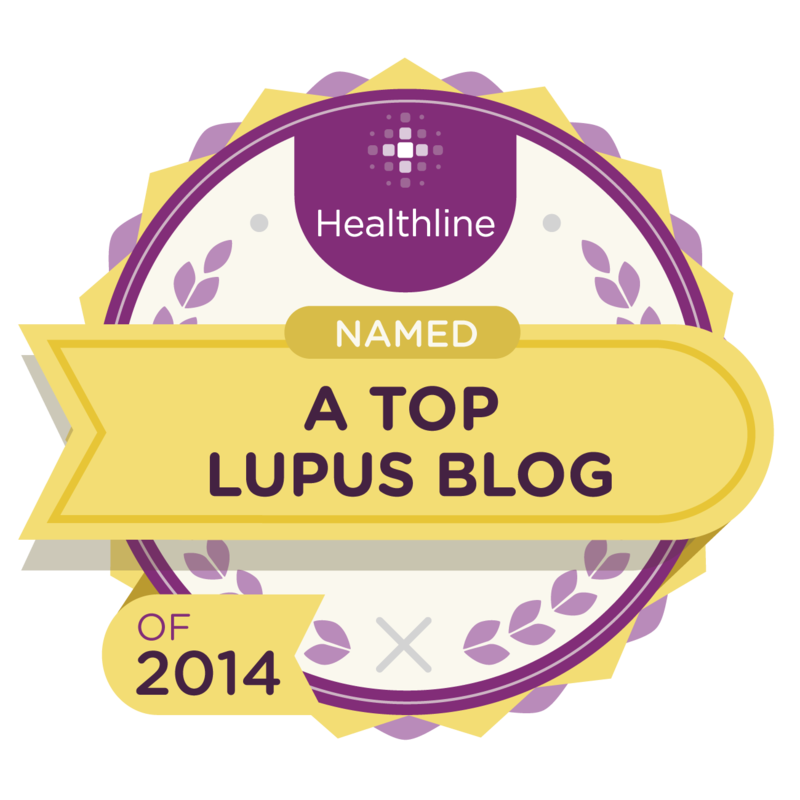 There have been times I have considered a half-formed plan in case lupus became unbearable. 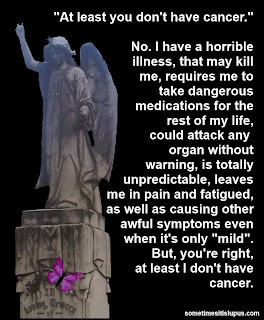 I've talked to other people with chronic illnesses who have had similar ideas. Strangely, having the reassurance that there's a way to stop things being unbearable, makes things easier to bear. 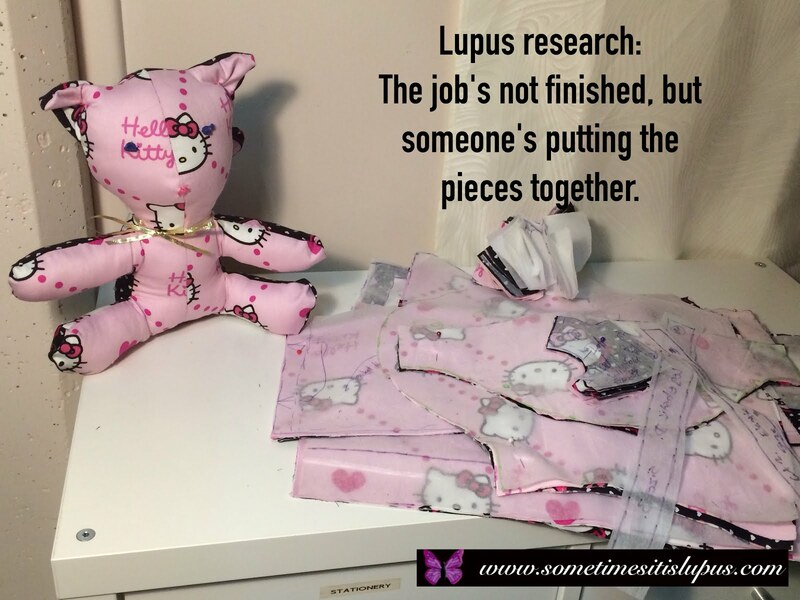 Lupus takes so much away from us: health, the ability to work, the ability to rely on our own bodies and minds, and replaces those things with fatigue, physical pain, and a sense of guilt about all the things we can't do. That's aside from the risk of organ failure, the constant blood tests, visits to multiple types of doctor, a whole life that at times seems to be built around a disease. 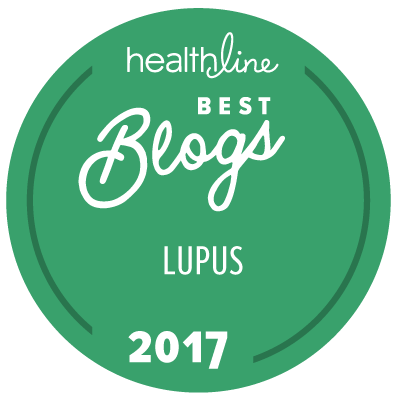 When lupus is really bad, and organs do fail, and pain is worse than usual, just opting out of everything can seem to be a solution. Hope. One day some scientist is going to work out that this tiny change to that tiny gene or whatever is the solution. 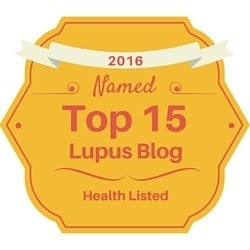 Lupus is going to be cured and we're all going to go back to normal lives. We want to be around to see that happen. Love. 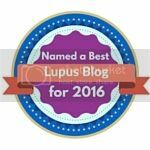 Each of us, no matter what lupus has done to us, have people we love and who love us. Those people would be devastated if we died. When we have a choice, we live for them. Faith. Viktor Frankl observed as an inmate of Auschwitz, that those who found meaning despite their suffering coped far better than those who did not find meaning. Whatever or whoever we have faith in, wherever we find our meaning, helps us get through things that would otherwise be unbearable. Future. Sure, things could get worse. But they could also get better. I can hold out a bit longer and find out which. Present. Is this a "right now" thing, that will improve tomorrow or next week? Past. I've been through bad things before. If I could get through those, I can get through this bad thing that's happening now. Community. None of us is alone in this. 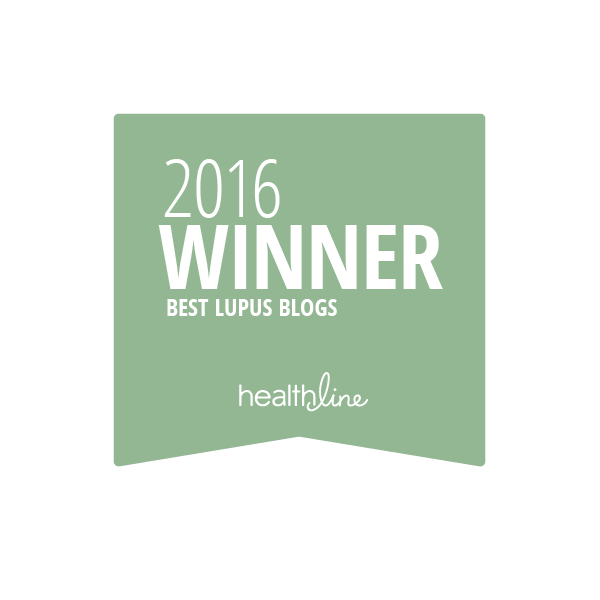 We belong to a community of people with lupus. Whatever we are going through, there's someone else who has been there and done that. Stubbornness. The simple determination to not let this dumb disease win. Support. Sometimes talking things out with someone, or having a friend or family member come in and catch up the washing we've been too sick to do, is all it takes to make the situation bearable after all. Suicide is an understandable, and even in some cases reasonable, response to an incurable illness, but if you're considering it, I'd ask you not to take the decision lightly. First step back, and look at the whole picture of your life and the network of the people your life impacts on. 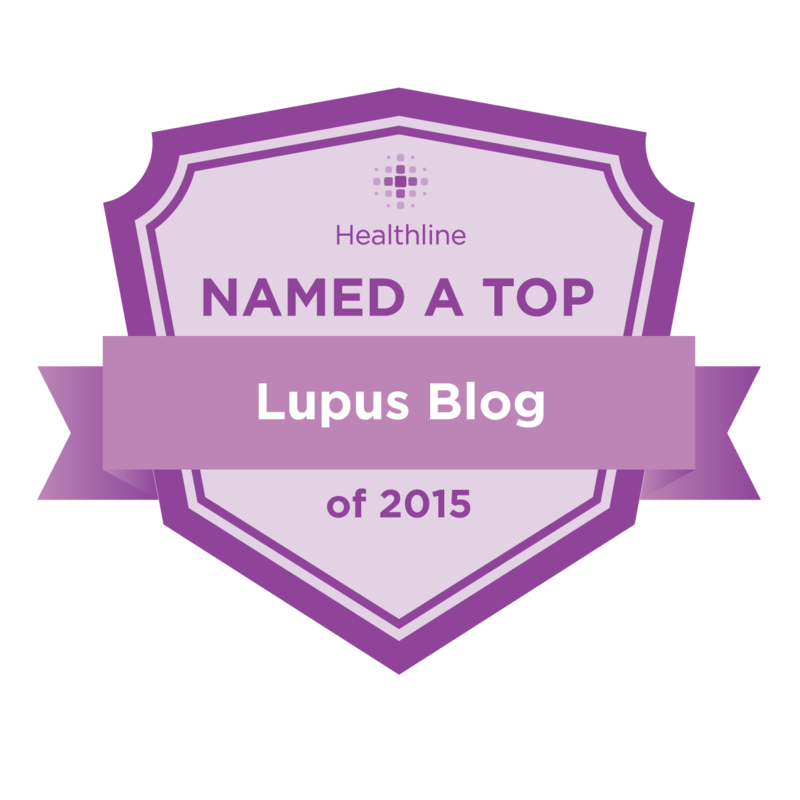 Talk about it, with fellow lupies, with your doctor, with your family, with a counsellor. 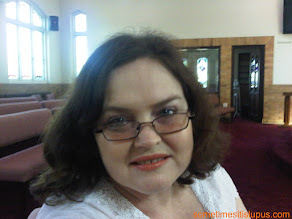 Don't make this decision hastily, or alone, or in the pit of depression. If this post has raised issues for you, and you need to talk about it, you can call Lifeline on 131114 from anywhere in Australia. Great post. 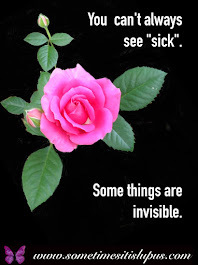 I am sure that more people than we may imagine with incurable and degenerative illness think of this solution.